Her gaze remained on the man sitting behind the desk, her expression giving the impression that she couldn't have been more bored. Despite this she did not once allow herself to break her posture, back rigid, hands folded behind it. As tempted as she was to allow her eyes to wander around the office, she wasn't even going to give him the pleasure of thinking he was getting to her. Besides, she had seen it a few times now. The walls were made of a reflective metal that gleamed in the bright light, spaced evenly from each other to form a decent sized box. To her left stood a bookcase littered with a number of older tomes and texts, to her right a glass case displaying medals, trophies, and photos. After some time had passed she rolled her eyes, Imperial accent coming through clearly when she spoke, "Major." "We've been over this a number of times," he muttered, not looking up once from his work, "I am a very busy person. When I am free and can get around to your requests, I will consider doing so." He fell silent again, continuing to tap away at his console. She rolled her eyes, a hand leaving its position behind her back to motion at the console. Xulmisi smirked to herself as the Major let out a number of curses, before staring at her. Her tone carried an air of amusement now, "Now that I have your attention. I would prefer having my permits processed now, Major. Especially considering I am unable to have any of my digs continue to work without them." "And I will repeat myself again," he started, before being cut off by her raising a hand. "Please stand, Major," she said, motioning for him to rise. Major O'Connell muttered something to himself, but stood all the same. She seemed even more amused now, a smirk firmly in place on her face. "Repeat what you just said, but to where I can hear it." O'Connell scowled, growling loud enough for his voice to echo off the walls, "I can't say I've ever been reprimanded by a slave before." "Lovely. Exactly what I thought you said," she replied, both hands coming forward now. She idly motioned upward with her right hand, and closed her left as if grabbing something. Behind the desk the Major slowly rose from the ground, gripping his throat. The Twi'lek looked him over, shaking her head, "And now you've brought me to such a generic form of making you understand." She frowned, motioning towards the wall, the man flying towards it as if flicked by some giant unseen creature. "I have to be a bit more creative, don't I." O'Connell slid along the wall, ending up in a pile on the floor. He slowly sat up, taking deep, desperate breathes. She slowly walked over towards him, staring down at him. He slowly worked his way into the corner, like an animal with nowhere to run. Her voice remained calm, the amusement gone for now, "Now, Major. I want you to understand something. I am not a slave. I was at one point, but I am such no longer." He was still breathing hard, and only acknowledged her by spitting at her feet. 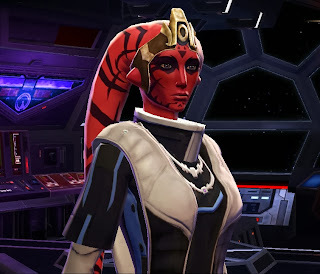 She kneeled down, grabbing his chin with one hand, pulling his face to where he was looking directly at her, "I am a Dark Lady of the Sith, Major. And you are being horribly disrespectful to me. And we cannot have that." "And just what are you going to do about it?" She gently patted the side of his head, a horrible grin creeping onto her face, "They say there is no such thing as a stupid question. But there are certainly those you will regret asking." With that she stood, turning and walking back over towards the desk. Behind her the man's face twisted into a look of pure terror as he tried to force himself more and more into the corner, trying to escape some unseen horror. She paid him no mind. She hit the button on his desk that would call his secretary. As much as she tried, she could not for the life of her recall the secretary's name, simply deciding not to bother, "Please send in the person directly under Major O'Connell." Walking back towards the door, Xulmisi returned to her previous stance, back straight, hands folded behind it. After a few minutes had passed, another man entered, this one slightly younger. Upon seeing her he quickly offered a salute, standing at attention, "My lady, what can I do for you?" She smiled sharkishly, "I am simply here to congratulate you," she trailed off, looking for his name and rank, "Captain Connors. You've been promoted, and with such you will be rewarded with this lovely office." Captain Connors frowned, shaking his head, "This is Major O'Connell's office, my lady." She couldn't help but smirk, "He will no longer be needing it. Of course you will inherit his work as well, but I'm sure that will not be difficult for you. It would be absolutely lovely of you to get my permits signed for." She slowly walked around him, watching his eyes search the room for, and finally find the Major. When she knew he had done so, she lowered her voice, any sort of pleasantness in it having vanished, "I'm certain you will be much easier to work with than your predecessor." Connors gulped loudly, nodding. With that said, she exited the room, leaving him to pick up the still terrified Major from where he was cowering in the corner, fleeing whatever his mind decided was most terrifying.